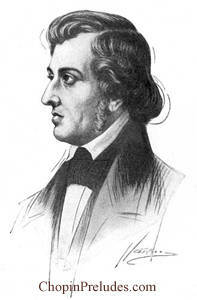 The winter of 1838 which Chopin spent with George Sand on the Island of Majorca was one of the most important in his life, for it was here it is said that he composed (or at least edited and prepared for publication) some of his most popular masterpieces, his preludes – a word which might be paraphrased as Introductions to a new world of musical emotion. There is a strange discrepancy in the accounts which Liszt and George Sand give of the Majorca episode in Chopin’s life. Liszt describes it as a period of calm enjoyment, George Sand as one of discomfort and distress. As she was an eye-witness, her testimony appears the more trustworthy, especially as it is borne out by the character of the preludes which he composed there. There are among Chopin’s preludes a few which breathe the spirit of contentment and grace, or of religious grandeur, but most of them are outbreaks of the wildest anguish and heart-rending pathos. If tears could be heard, they would sound like these preludes. Two of the saddest — Prelude no. 6 in B minor and Prelude No. 4 in E minor — were played by the famous organist Lefebure Wely, at Chopin’s funeral services. Copyright © 2016 Chopin Preludes .com All Rights Reserved. All available to download instantly in Adobe PDF format - Just Print and Play!